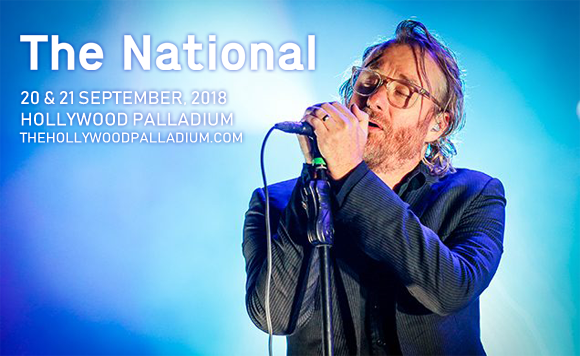 It's the second in a two night run for Grammy Award-winning alternative rock band The National comes to Hollywood Palladium on Friday 21st September 2018! The renowned indie group are touring in support of the aforementioned Grammy-winning album, Sleep Well Beast, performing tracks like the dreamy single "The System Only Dreams in Total Darkness"! Formed in 1999 in Cincinnati, Ohio, American rock band The National released its self-titled, independently released debut album in 2001. The band's third studio album, 2005's Alligator, brought them mainstream attention, receiving rave reviews from Pitchfork and other publications, and the band's fourth and fifth studio albums, Boxer (2007) and High Violet (2010), secured them as indie rock favorites. The band's most recent album, 2017's Sleep Well Beast, won the Grammy award for Best Alternative Music Album at the 60th Annual Grammy Awards.